In the embarrassing wake of two scandals involving two different Missouri lawmakers who have both been forced to quit after accusations that they sexually harassed their interns, the Missouri House is discussing instituting a new dress code. For the interns. That’s it. That’ll do it. 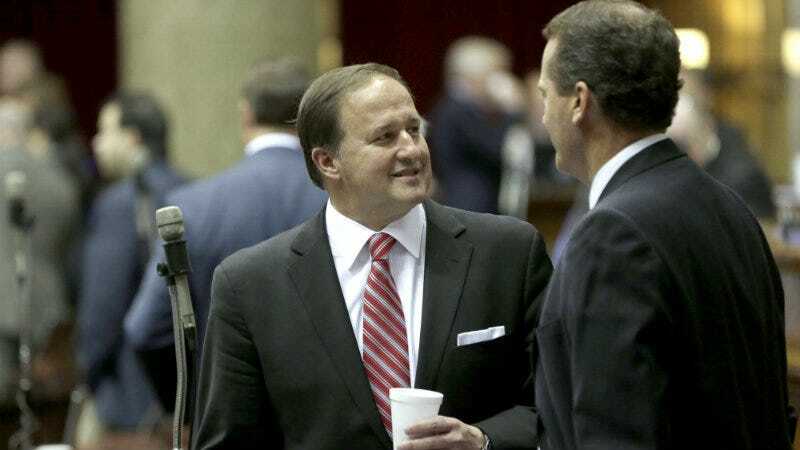 The dress code suggestion comes after House Speaker John Diehl sexted with a 19-year-old intern and was found out, which resulted in the internship program being suspended and his eventual resignation. In July, a Senate investigation revealed that two more interns, who worked for him years apart, accused State Senator Paul LeVota of sexual harassment. Hirth told LeVota that she makes it a point not to drink alone with married men. After a couple of innocuous texts, LeVota tried again. “Well if there ever is a loop hole, don’t be so hard on yourself,” he texted back. Hirth said the exchange opened her eyes. “That was when it became apparent that it wasn’t innocent and it was only going to get worse if I continued to ignore it,” she said. In February, college senior Alissa Hembree found herself the subject of LeVota’s still-creepy attentions. She told the Kansas City Star that she cut off 22 inches of her hair to “seem more invisible” to the senator and stopped wearing dresses and heels to the office. That didn’t work. She cut her internship short, working two months instead of the planned five. LeVota, too, ultimately was forced to resign. He was seconded by Republican Rep. Nick King of Liberty. Rep. Kathy Swan, a Cape Girardeau Republican, said in an email that dress codes are common HR policies in the workplace. “The most valuable and valid internship experiences are ones where interns are embedded in the work environment, which includes the same/similar job expectations as employees, including dress code,” Swan said. But enthusiasm for the idea wasn’t shared by Democratic lawmakers. Presumably when that doesn’t work, the House will consider a dress code for lawmakers that involves a sturdy chastity belt and the blinders that carriage horses wear.